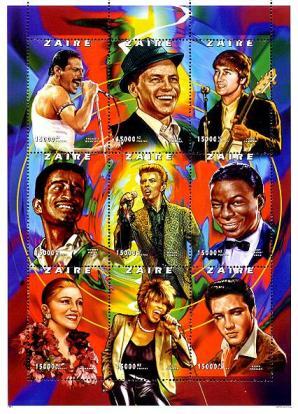 Fake Zaire stamp sheet: A Tribute in Stamps to the Century's Greatest Actors: Nine stars including David Bowie, Frank Sinatra, Sammy Davis, Freddie Mercury, John Lennon, Nat King Cole, Madonna, Tina Turner and Elvis Presley. There are a number of philatelic products still printed with the country's old name Zaire, which again are all counterfeit and illegal. Zaire changed its name to Democratic Republic of Congo in 1997. The Republic of Udmurtia, which is an autonomous region east of Moscow. All "stamps" from this republic are counterfeit, not valid postage stamps and have no investment value. The above 'First Day Cover' is also fake. 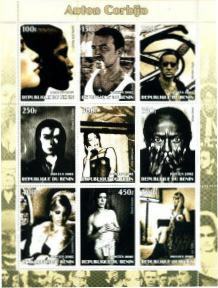 Anton Corbijn Famous Photographs containing nine portraits issued by Republique du Benin in 2002. The images include David Bowie, Bono, Nicholas Cage, Miles Davis, Cameron Diaz, Lily Tyler and others. These "stamps" are counterfeit, not valid for posting and have no investment value. 2001 stamp pertaining to be from the Union of Myanmar. 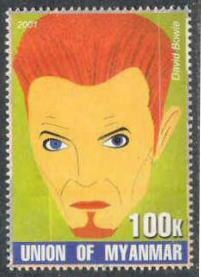 One stamp featuring David. Part of 'The Illustrated Portraits of Music Stars' set that also features Prince, Marilyn Manson, Kurt Cobain, Eminem, Keith Richards/Mick Jagger and Madonna. These "stamps" are counterfeit, not valid for posting and have no investment value. 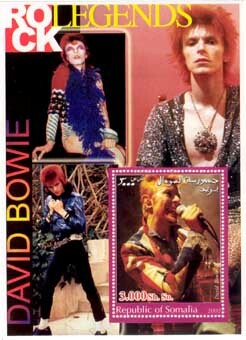 'Rock Legends: David Bowie' pertaining to be from the Republic of Somalia. 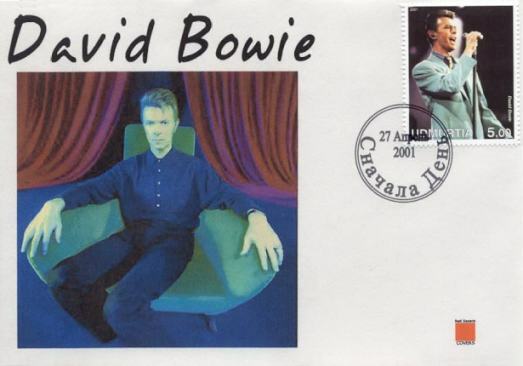 The stamp features David wearing his Union jacket frock coat during his Earthling 1997 world tour. This "stamp" is counterfeit, not valid for posting and has no investment value. 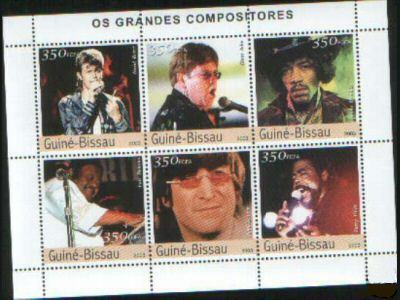 'Os Grandes Compositores' stamp set featuring David Bowie, Elton John, Jimi Hendrix, John Lennon and Barry White. Pertaining to be from Guine-Bissau. These "stamps" are counterfeit, not valid for posting and have no investment value. 2011 stamp pertaining to be from the Republique de Djibouti. 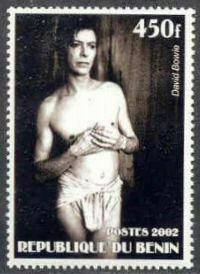 The stamp features David from his A Reality Tour. This "stamp" is counterfeit, not valid for posting and have no investment value. 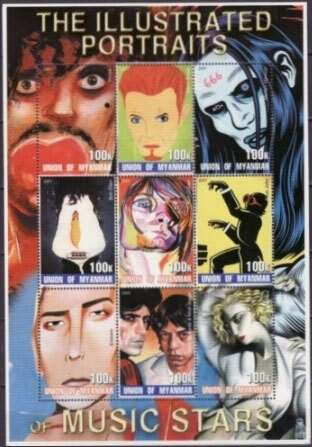 Fake European 'British Rock' David Bowie stamp sets - Originating from Australia. Please beware of purchasing these ILLEGAL and FAKE stamps on eBay and from disreputable stamp dealers around the world.